It’s Saturday night and things are hopping at De Zotte, the small cafe around the corner from my Amsterdam home. Not surprisingly, it’s an overwhelmingly young crowd, but not exclusively so. There are few other nearly golden-agers among the customers. They generally seem to be having food with their drink, however. I’m starting off with Jack’s IPA, which tastes more like an American ale than anything else I’ve had since I got to Amsterdam. Very hoppy with quite a kick on the backend. At 7.5 percent, it’s also a bit on the high side for alcohol. May switch to something a little less alcoholic. Amanda went home today. It was great spending the week with her. She was an easy travelling companion because as she said, “I’m pretty much down with everything.” And she was also very easy-going about the various mishaps that occurred through the week, from the aborted canal cruise on Saturday to the unplanned, multi-hour bike cruise through southeastern Amsterdam to getting separated and completely lost from each other on the way to train station Friday morning, she took it all in stride and had a great time. That’s everything you can ask for when traveling with someone. The apartment is much emptier without her here. No trip to a major city with centuries of history, at least no Dykhuis trip to such a place, would be complete without visits to old buildings. In our case, that meant visiting some churches. In Amsterdam, we toured the Nieuwe Kerk. The name, “New Church”, is something of a misnomer. The Nieuwe Kerk was built in the 13th century and burned down almost entirely in 1645. It was rebuilt in a Gothic style. It no longer functions as a church but is used for special exhibitions and concerts. An exhibit in honor of Marilyn Monroe’s 90th birthday opened at the beginning of the month. Putting up an exhibit in a church, especially one of such grandeur, to honor of Marilyn Monroe did shake my Calvinist. (Never mind that the church was built by Catholics.) But that didn’t stop us from buying tickets to the show. Museum, the audio tour was included in the price of the ticket. This is something that more places should do. It adds a great deal to the experience. One of the deft touches from the exhibit curators had a tableau of crime photographers and policemen at Monroe’s death bed just below the burial site and monument of Micheal de Ruyter, a Dutch naval hero. It’s almost as if de Ruyter is watching over Monroe’s apartment. Quite well done. Of course, if there is a Nieuwe Kerk, there must be an Oude Kerk (Old Church), and it is not far away. We, however, did not go over there. We did get a pretty good look at it on the canal tour and heard about some of it’s history. Interestingly, the Red Light District is almost in the church’s shadow. Another of Amsterdam’s many curious juxtapositions. Our other trips to old buildings came during our trip to Delft on Friday. We took the train from Centraal Station to Delft, which is about an hour ride. Delft is a lovely small town. After a week of the crowds and frenzy of Amsterdam, it was a welcome change to experience the calm and placid village. After lunch, our first stop was the Royal Delft factory. They have a self-guided tour of the factory. You get to see how the pottery is made and what it looks like in the various stages of development. At the end, of course, you get to choose which pieces to take home. Amanda spent a great deal of time agonizing the best pieces to bring home as souvenirs. After that we got tickets for Delft’s Nieuwe Kerk and Oude Kerk. One ticket gets you into both churches – they’re only about a five minute walk apart. Unlike the Amsterdam churches, both of these still have services every week. The Nieuwe Kerk is on the square in the center of the town, the Markt. It has a tower that is also accessible if you’re up to climbing 384 steps. It is a very narrow winding stairway and requires a strong inhalation to let people pass in the opposite direction. It’s quite the hike but very much worth the effort when you get to the top. Not only do you get a striking view of Delft but to the south Rotterdam springs up and to the north you can see Den Haag. Delft’s windmill can also be clearly seen. Construction of the Oude Kerk dates from the 13th and 14th centuries. Here is where Johannes Vermeer, one of Delft's most famous residents, was buried. Construction of the Nieuwe Kerk was begun around 1380 and completed sometime after that. 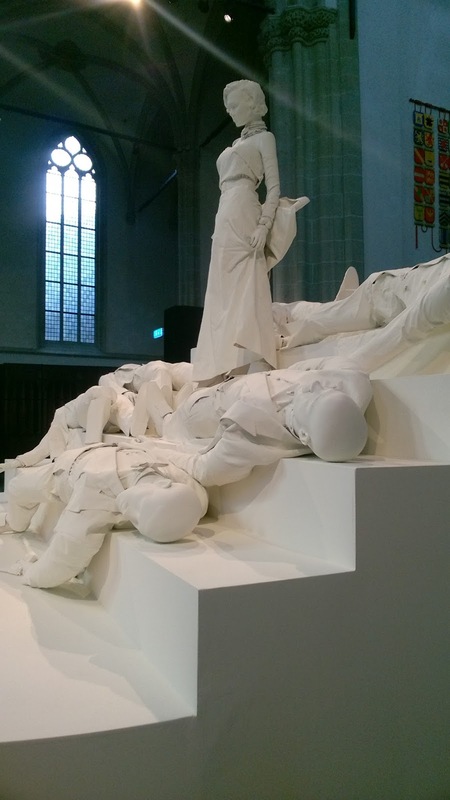 All of the countries royal family are buried in the Nieuwe Kerk. 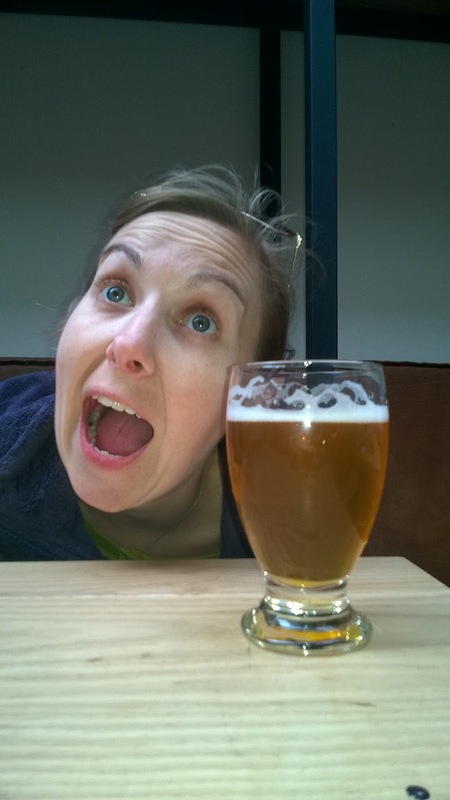 After so much exertion, both mental and physical, Amanda had a hankering for apple pie. 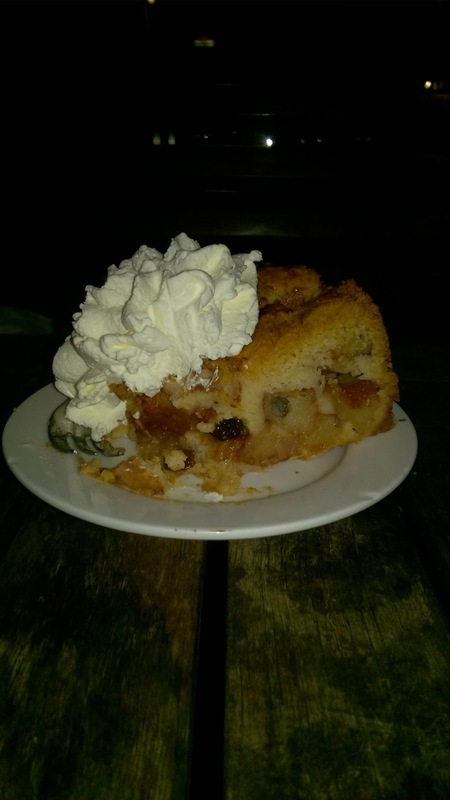 We found out from a young local man, who saw our obvious distress about where to find good apple pie, that the best place in town was Cafe Oude Jan, which we had already visited and learned they had sold out. Sadly, we turned back to the train station and headed back to Amsterdam. Upon arriving home, Amanda got on Trip Advisor and found that the most highly rated place in Amsterdam for apple pie was only a short bike ride from us. So we headed off to Winkel 43 a bit north and west of us in the Jordaan. It was nothing like apple pie you find in the states. Rather than apples, glaze, and some spices baked between two pieces of pie dough, this had more in common with pastries such as croissants. The pastry wound its way around the apples and while it looked like a lot of dough it was light and tasty. It was amazingly good apple pie.